The event that drives the story of Binti happens far offscreen. 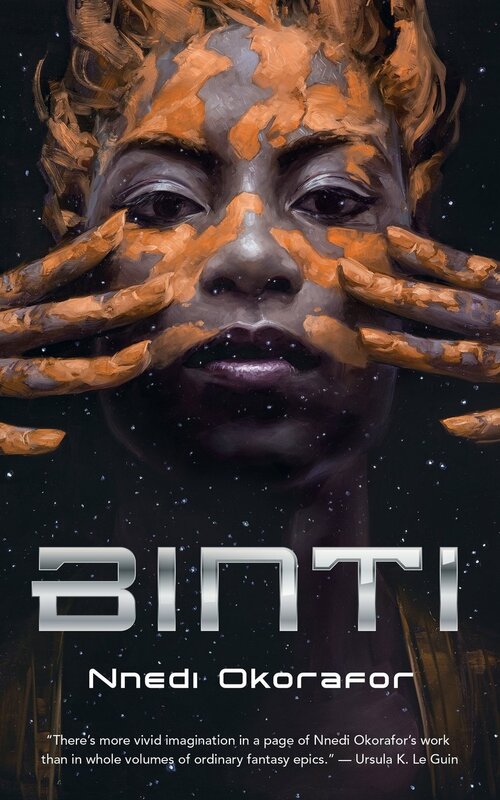 The book begins, in fact, as if it were an entirely different story: the titular Binti is a mathematical prodigy going against her conservative culture and abandoning the family business to go to a prestigious alien university. She sneaks out of the house. She gets on the ship. She runs the gauntlet of disapproving, intimidating teachers. She makes friends with her fellow future students. She even meets a boy she might have liked. And that's when it all goes suddenly and horribly wrong: the real story, the one that started offscreen and has been gathering momentum all this time, comes crashing in at an oblique angle and shatters this gentle narrative of the pursuit of higher education. Everyone dies—the authority figures, the friends, the boy—and Binti is a sixteen-year-old alone on a ship hijacked by hostile aliens. And that's how we meet the Meduse. The Meduse look like human-sized floating jellyfish, "their domes' flesh thin as fine silk, their long tentacles spilling down to the floor like a series of gigantic ghostly noodles"—I found the sudden noodles delightfully bathetic after the blood and violence of their introduction. We meet the Meduse stinger-first: one of them reenacts the chestburster scene from Alien with the boy, splattering Binti with his blood in classic horror-film fashion. We learn that the Meduse have a history of war with humans but this is a surprise attack in a time of peace. Actually, that's not quite true. The Meduse have a history of war specifically with the Khoush, apparently the dominant human ethnocultural group in this time and whose monopoly on space travel seems absolute: the Meduse appear unaware that there even are any other kinds of human until they meet Binti. But this isn't why Binti survives the initial attack. The Meduse can't touch her because of a mysterious ancient artefact she's carrying, the edan. These are the two things that stand out brightest for me in this story. On the one hand, we have the edan and what it implies. On the other, we have the inciting incident, the reason the Meduse are attacking. So let's put them both aside for a moment and talk about Namibia. Binti is Himba. There are only two ethnic groups mentioned in the book, the Himba and the Khoush. The Himba of course are a real people from Namibia, and Binti introduces herself at one point as "Binti Ekeopara Zuzu Dambu Kaipka of Namib." There are some differences between her people and our contemporaries, as far as I can tell, social and cultural changes that fit into a world where galaxy-spanning space travel is a norm and multiple alien civilizations abound. For example, her people are not pastoral but are clans of specialist artisans with valuable techno-mathematical skills. But they're also still a minority, still marginalized just as they are in our world. In our world, between 1904 and 1907 imperial Germany wages a war of extermination in Namibia. Under Lothar von Trotha, the Germans kill tens of thousands, including people of the Herero and Nama ethnic groups, and the Himba too. Eleven of von Trotha's descendants visit Namibia in 2007 to make a formal apology. (They get police protection to make this apology. Nobody attacks them.) Since 2004, the German government finally begins to acknowledge that the genocide occurred but so far refuses to pay reparations. Their most recent acknowledgement of fault, and concomitant refusal to do more than acknowledge fault, is only about eight months old as of this writing. The edan is a stellated cube of unknown metal with mysterious markings on it. It is clearly a device—Binti says that a "desert woman" once called it a "god stone," but herself describes it to spaceport security as "inert computative apparatus" that she carries around for luck. Binti found it in the desert years ago: "edan" means a device so old that nobody knows what it is or what it does. It's telling that they have a word for this. When the Meduse attack Binti, she's holding the edan and praying for protection. It destroys the Meduse that attacks her and the others draw back. Later, she discovers that she can use it to communicate with them. It is both translator and weapon but to the edan these are both aspects of the same function: the direct manipulation of the electrical-informational fields that Binti calls "current." The violence it's capable of effecting on Meduse bodies is weaponized conversation. And the Meduse seem to recognize the edan. They call it "shame"—an intense, intimate way to refer to an object. They say that "no Meduse has ever spoken to a human . . . except long ago." This, and the fact that the edan might actually be ancient Meduse technology lost long ago on Earth, suggest to me that perhaps the Meduse did have some relationship with the Earth in the deep past. Perhaps they are the gods that are meant when people call the edan a god stone. The shame that it evokes for them could be the shame of having inherited the legacy of terrible acts—the shame that drove the Von Trotha descendants to Namibia in 2007. Or, conversely, it could be the shame that comes from defeated pride, the shame of having been on the side that lost, the shame of being descended from survivors. The devices that were clearly intended to enable equitable communication between human and Meduse are now viewed as shameful. The very act of interspecies communication is detestable, nearly forgotten as a possibility. Once communication is open, almost the first thing Binti hears is that the Meduse consider her (and all humans) fundamentally, essentially evil. Perhaps this is another hint to the breaking of an ancient relationship, perhaps it's just propaganda to do with more recent wars. Either way, despite the attack on a human ship and the massacre of human passengers, the Meduse aren't restarting their old war with the Khoush. They just wanted to use the innocuous student transport ship as a Trojan horse to get an assault team onto Oomza: the human deaths are incidental, perhaps because their long-standing resentment against humans allows them to discount this violence. The violence that concerns them is the violence that has victimized them: at some point in the past, Oomza University scientists or their field operatives assaulted and mutilated a Meduse chief, removing the very stinger from his body and bringing it back to Oomza to be displayed in a museum. The Meduse want revenge and that's what this attack is all about. In 2011, Germany returns 20 human skulls to Namibia from the Charité teaching hospital in Berlin where they had been for more than a hundred years. The skulls were taken from victims of the genocide, transported to Berlin to be mad-scienced for signs of racial inferiority. There are thousands more such human remains in various institutions in Germany to this day. Some of these must be the skulls of Himba people, though nobody will ever know which. "My stinger is my people’s power,” the Meduse chief says. "They took it from us. That’s an act of war." For all that they're aliens, the Meduse response here is fairly straightforwardly treating it as castration. Their rage comes from the shame of emasculation. Judging from their wholesale slaughter of humans aboard the ship, their intention is to land on Oomza via their Trojan horse, then embark on a killing spree. With great effort, Binti talks them down to accepting negotiation and volunteers herself as negotiator, but the Meduse chief demands that she relinquish her edan first. She must willingly divest herself of both her ability to destroy them as well as her ability to understand them. When she does, they immediately sting her unconscious. When Binti wakes up, she can understand the Meduse without the edan. Like the Khoush they've touched her hair without permission, only they've gone a lot further than that. Earlier, a junior Meduse called Okwu bonded with Binti over what it perceives (I'm following the book's convention in using the neuter pronoun) as a commonality between her plaits and its tentacles, both of which it places in the same category of okuoko. Now, the Meduse make this literal by replacing her hair with actual tentacles, authentic okuoko. "The okuoko were a soft transparent blue with darker blue dots at their tips. They grew out of my head as if they’d been doing that all my life, so natural looking that I couldn’t say they were ugly [ . . . ] I pinched one and felt the pressure." These are functional organs allowing for communication without the use of the edan, so they're not just replacements for her hair but integrated in alien ways with her brain and nervous system: tremendous changes made to her body without her consent or knowledge. Okwu says "you had to understand us and it was the only way," but this is manifestly untrue: Binti was communicating successfully earlier with the edan. The Meduse chief calls it a gambit to improve their chances in the negotiation, which is closer to the truth. He says Binti needed to prove to Oomza that she was truly their ambassador, not a prisoner: i.e., the Meduse wanted Oomza to think that Binti was a willing defector. She doesn't even realize that her plaits are okuoko until it's all over—they're covered in otjize and she has more immediate concerns—so this happens exactly as intended. The negotiation, with Binti as unknowing defector, goes well. The Oomza representative committee, headed by a spider-like alien, expresses shock and dismay at the cultural appropriation that they've all unwittingly committed. (The Oomza representative speaks fluent Meduse without an edan or being forcibly okuokoed, by the by.) Oomza has no idea how the stinger ended up in their museum, how the skulls ended up in their hospital, but it was all for science and they regret any hurt that was caused. "The scholars who did this will be found, expelled, and exiled," Oomza promises, emptily. The theft and display of the bodies and artefacts of conquered peoples in the museums of the victors, these are well-understood mechanisms even in our world: the galaxy's premier multispecies university and centre of learning was not born yesterday. Oomza brims with latent violence, armed guards, and imperial arrogance. Binti's mother was right all along and Oomza is a multicultural superpower, an imperial actor with the plausible deniability of science and academia. The stinger is returned. Binti uses her otjize to reattach it and heal the wound. Even the scar fades. The insult of its theft is undone. Perhaps that's why all the aliens hold humans in contempt: damage done to our bodies is not reversible. We never heal. We are walking catalogues of injury, nothing but scars held together with spite. We can never aspire to the clean, zero-fallout violence of the Meduse, the antiseptic cosmopolitics of the galaxy. Human violence is always dirty. The crisis over and finally a student at Oomza University like she wanted in the first place, Binti runs out of otjize. She's out of the clay from home that she uses to make it, so she has to find a new supply native to Oomza. She is successful in this, but making the new otjize for the first time is a greatly stressful, anxious process for her. What if it doesn't have the right consistency or texture? What if it doesn't work for her as a functional replacement to Earth otjize? She weeps with relief when she discovers that it does. But then she meets Okwu, who has also stayed behind as a student, and he demands something else of her. He's been lightly injured in a lab accident: he wants to know if her new otjize has the same healing properties as the original. Binti is immediately cast into turmoil again. "The relief I’d felt at the naturalness, the trueness of the otjize immediately started waning. This was the real test." Binti allows Okwu, almost without realizing it, to redefine her otjize, to tell her how to feel about it. It had and has its own significance to her, until the Meduse decided it was of use to them. Chillingly, the Meduse have appropriated her in her entirety: her body, her culture, even her mind. As a metaphor for acculturation into empire, this works almost too well. You can walk in the halls of empire, yes, as long as you're willing to accept invasive alien tentacles into your mind, to put alien needs above your own, to allow yourself to be instrumentalized. It's not an unhappy ending, exactly—Binti reconciles with the parents she ran away from. But it's bittersweet, perhaps bitter-bitter, in the acceptance of unavoidable change, the littleness of that which can be preserved. Against all odds, Binti makes room for herself where she can. Perhaps we should celebrate that, because none of us will get a better deal. Vajra Chandrasekera is a writer from Colombo, Sri Lanka. His fiction has appeared in Clarkesworld , Lightspeed , and Black Static , among others. For more, see his website or follow him on Twitter. Vajra Chandrasekera is a writer from Colombo, Sri Lanka. His fiction has appeared in Clarkesworld, Lightspeed, and Black Static, among others. For more, see his website or follow @_vajra on Twitter. Thank you for this wonderful analysis of the story!!! Good article. I'm reading the sequel now. One thing I bumped on in the article is the idea of appropriation of the otjize. You say the Mediaeval decided it was of use to them, but I'd say it's more like they discover it was useful. How can you expect Okwu to not be interested in it, and Binti to not to feel differently about it?